Carbon monoxide (CO) is a poisonous gas that is colourless, odourless and tasteless. If inhaled in sufficient quantities, CO can interfere with the body’s ability to absorb oxygen. At low concentrations, symptoms of CO poisoning present similar to flu symptoms: headaches, nausea, fatigue and dizziness. In higher concentrations or prolonged exposure, symptoms can worsen and cause loss of consciousness and death. Carbon monoxide exists naturally in the atmosphere in small concentrations and is also a combustion by-product of carbon-based fuels. CO is produced when the combustion of a carbon-based fuel is incomplete, usually due to insufficient oxygen during the combustion process. Balanced fuel and air mixtures can minimize the amount of CO produced during combustion, while venting combustion gasses to the atmosphere prevents CO build-up from occurring in enclosed spaces. 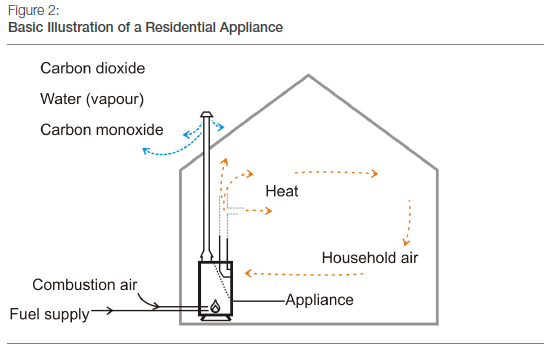 A failure to effectively vent the products of combustion away from enclosed, occupied spaces. Excess CO being produced by fuel-burning appliances. This case study provides an overview of the incidents involving CO that were reported to and investigated by safety officers occurring from January 1, 2007 to December 31, 2015. It is important to note that Technical Safety BC does not regulate all fuels that produce CO; therefore, occurrences involving fuels not regulated by Technical Safety BC are not considered in this review. A total of 84 carbon monoxide incidents were reported and investigated between 2007 and 2015. These incidents resulted in nine fatalities and 161 non-fatal injuries. A list of the incidents is included in Table 2, at the end of this document. There is a variation in the number of carbon monoxide incident investigations from 2007 to 2015. 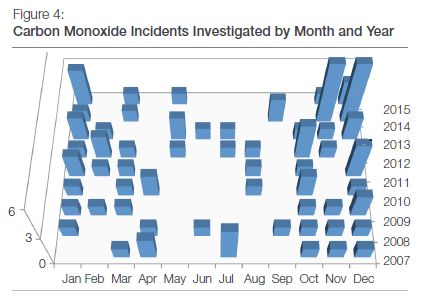 Figure 4 shows the distribution of CO incident investigations by month. Most CO-related incidents occurred from October to April. During this nine-year period, CO incidents resulted in nine fatalities and 161 non-fatal injuries. In June 2008, one incident resulted in 27 employees at an industrial facility where the investigation stated the employees being taken to hospital and found to have CO poisoning. In 2014, one incident was reported to have affected 15 people who went to hospital after some residents reported experiencing symptoms of CO exposure. Most incidents occurred in residences and involved residential furnaces, boilers or water heaters. Each investigation identified at least one appliance that produced, or may have produced, carbon monoxide. Note 1: Some investigations identified multiple appliances that may have produced CO, yet did not confirm which was most likely the CO source; therefore, the total number of appliances exceeds the number of events. For example, there were 38 incidents that identified furnaces for potential involvement. In 30 of these 38 cases, the investigation confirmed that the furnace was the source of excess CO. In the remaining eight cases, the investigation could not confirm that the furnace produced excess CO, or the investigation identified that there were other appliances (in addition to the furnace) that could have produced excess CO.
Investigation activities focus on understanding the relationship between regulated work or regulated equipment and the factors that may have contributed to the cause of the event. Factors contributing to the CO incident occurrences are summarized in Table 1. Additional details are available in Table 2. Note 1: Although elevated CO was observed, the investigation was either unable to determine the cause or unable to rule out the involvement of regulated equipment. From 2007 to 2015, there were 84 incidents reported to Technical Safety BC. These incidents resulted in nine fatalities and 161 non-fatal injuries. Most CO incidents occurred from October to April. Most incidents occurred in residences and involved residential furnaces, water heaters or boilers as the source of CO, while ineffective venting and maintenance were identified as the most prevalent contributing factors. This data highlights the importance of proper installation and maintenance of residential fuel-burning appliances and their venting systems. It also illustrates the importance of using CO detectors in homes that have fuel-burning appliances. Carbon Monoxide Incidents (2007 - 2015) are provided via a downloadable .CSV file. This listing provides an overview of the incidents involving carbon monoxide (CO) that were reported and investigated by Technical Safety BC safety officers. It is important to note that Technical Safety BC does not regulate all fuels that produce CO, therefore occurrences involving fuels not regulated by Technical Safety BC are not considered in this listing. Incidents involving work or equipment regulated under the Safety Standards Act are required to be reported to the appropriate provincial safety manager. The Province of British Columbia, however, delegated partial administration of the Safety Standards Act to a number of local governments. These local governments administer gas assessment programs for detached dwellings with gas services at a pressure of 14.0k Pa gauge or less with a total connected load for the meter of 120 kW or less and are identified in Appendix H. Gas incidents, including carbon monoxide incidents, occurring in these municipalities would be reported to the local government safety manager and may not be reported to BC Safety Authority. Technical Safety BC receives its injury reports and descriptions from operators or first responders at the time of, or immediately following, the incident. Injuries may develop after the initial reports were made to Technical Safety BC and the long term effects of a resultant injury may not be recorded as part of the Technical Safety BC investigation.